What better way to celebrate St George’s Day with a classic English pie made by a dedicated Yorkshire farm? Nova Scotia Farm are the ultimate producers – not only do they rear their own meat for their pies and ready meals, but they also produce 90% of the feed for their animals too! 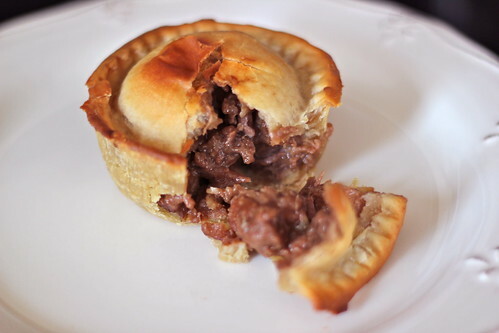 Traditional short-crust individual pies, suet crust pies and a range of ready meals are made with the highest quality, well hung Yorkshire beef and are truly delicious. Nova Scotia Farm can be found in the heart of Yorkshire, where happy families of cattle graze on grass sweetened by naturally filtered water which drains down from the Vale of York. Their natural surroundings and traditional husbandry means the herd is close to organic, just without all the paperwork! Back in 2001 the company were one of the first to start selling their beef nationally online, and from there they started making the pies. As demand increased, Mark and Sally the farmers, focussed more and more on pies and meals as customers looked for more convenient products, that still had the quality they were known for. As the company has grown, they now also use beef from other ‘similarly minded cattle producers’ to keep up with demand. How refreshing it is to find a convenient ‘ready meal’ that is made by a truly passionate artisan, that you can really trust! 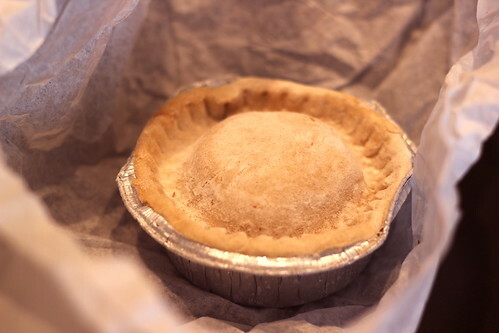 If you buy online you can choose either baked or unbaked pies – I went for frozen unbaked pies as I wasn’t sure when I was going to be able to eat them. They arrive in an ice packed box, complete with ‘dishes to dine for’ cooler bag, which I think you get free with your pies if you buy them at a show or festival. 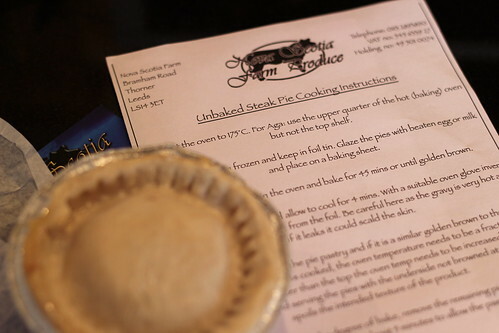 Concise cooking instructions are provided, along with advice to accommodate different types of oven and baking tips if the pie didn’t come out quite right first time. 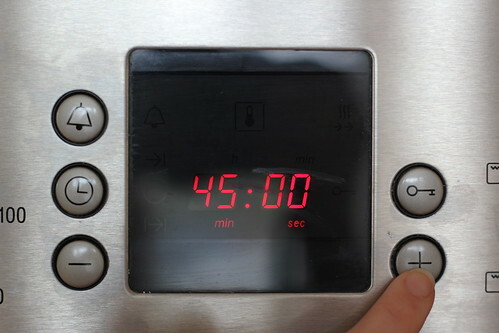 45 minutes of baking from frozen… what do they say about a watched kettle?! The smells coming from the oven were making my mouth water! 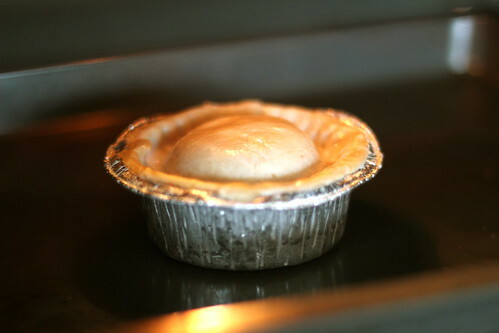 The result was a deliciously golden, steak filled pie with a really tasty, meaty gravy. You can see the hefty chunks of meat in the picture below, which are cooked to a melt in the mouth tenderness, along with the perfect amount of gravy. 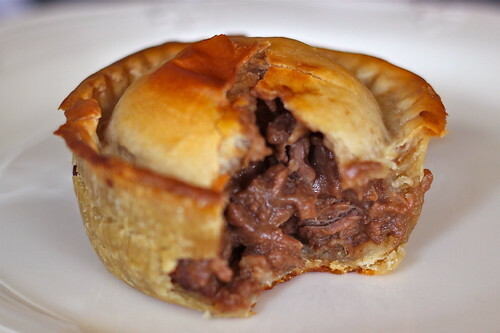 The pastry is the ideal thickness and crispness, expertly balanced to let the highest quality beef take the limelight. Mark and Sally have collected some rather impressive (and entertaining) testimonials on their website, so you don’t have to take my word for how wonderful they are. These pies would be perfect for dinner with mash and fresh vegetables or taken on a picnic for a real treat… or just eaten on their own like I did! You can buy them and other beef based dishes from Nova Scotia Farm Produce online and at lots of food shows and festivals across the country. Their ready meals are sold under the brand of ‘Dishes to Dine For’ so keep a look out for both – they certainly are ‘to dine for’!